University of Missouri St. Louis has made a strong commitment to cybersecurity education over the last couple years. The Alliance asked for their help in hosting our first St. Louis event of 2018 and they stepped up in a big way. The university provided an incredible space and logistics, making it easier for our staff and members to focus on the students. 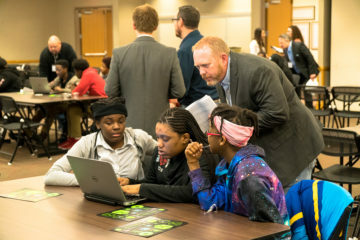 Security Leaders from Monsanto, Schnuck Markets, Scott Air Force Base and Spire Energy all contributed their expertise and time to make an impactful workshop for students from Jennings School District. 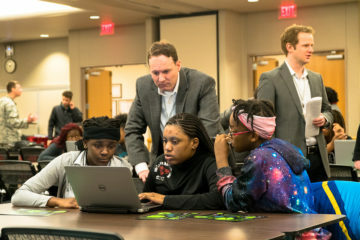 St. Louis Market Leader, Ryan Frillman led the day’s conversations around the basic principals of cybersecurity and used online tools to show the students the number of available positions by career track, and starting salaries in those positions. 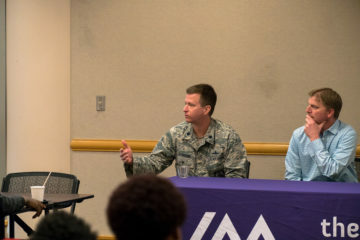 Lt. Col. George Sconyers, Senior Cyber Security Officer at Scott Air Force Base spoke to the need for increased diversity in the space both of race and gender but also in background and thinking pattern. Chris Sawall, Director of Cyber Threat Intelligence for Monsanto and a consistent leader within the Alliance, shared his experience with the different types of cyber threats that today’s businesses face. The pannel of local experts was rounded out with Joey Smith, CISO for Schnuck Markets. Joey expounded on his red team and the concept of ethical hacking. The students got very excited by the idea of being able to attack systems, without getting in trouble. 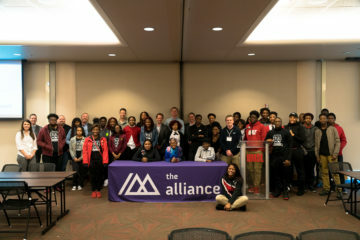 The cybersecurity volunteers helped the Alliance staff mature a new game that has been introduced as a part of the event curriculum. A student is chosen as the CEO of the class. A recipe is shared with the CEO as the “Critical Data”. Our information cybersecurity volunteers then lead the students through a series of simple scenarios to expose the challenges of basic information security. The human factor becomes apparent quickly and the students learn many of the challenges presented are solved with careful consideration of data traffic. The virtual Capture The Flag experience continued as a crowd favorite, creating competition amongst the students to solve questions and gain knowledge. The challenges in the game are designed to reinforce the principals explained earlier in the workshop. Our volunteers from several area companies provided incredible guidance for the students through the challenges of the game. Our workshop concluded with a conversation between students and leaders. The topic of conversation was the various pathways into the industry and the best character traits to develop between now and employment. Work Ethic, continual learning, analytical thinking skills and teamwork are always emphasized. As always, this event wouldn’t be possible without the incredible cybersecurity volunteers and our partners at Microsoft, Netskope, Cylance & UMSL.